We came back home yesterday and it was really coming back home. It was a wonderful 3 day break though it didn’t feel or look much like one, me with my laptop in tow. With a blogging marathon you can’t expect anything less right. I found it strange myself but then there you go! 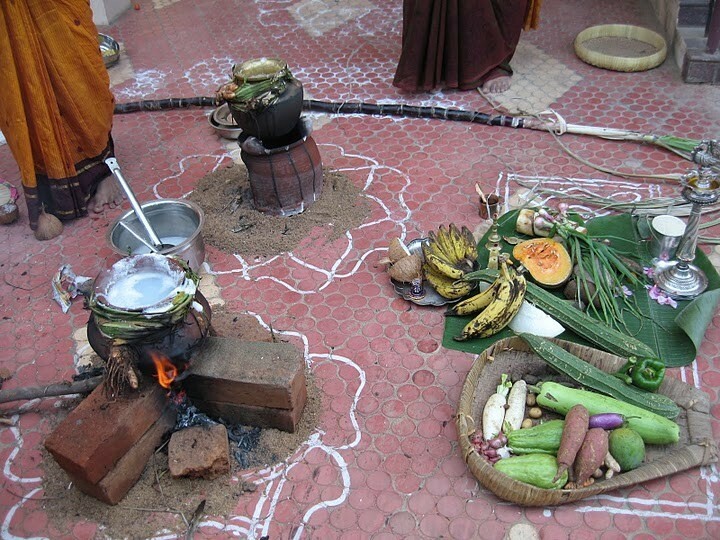 While I enjoyed posting about the Sankranthi Celebrations we had at my SIL’s place, I was elated seeing some more of traditional Pongal Celebrations shared by my friend U. I immediately asked her if I could share it on the blog, she was most kind enough to give me her pictures. I hope you enjoy these as much as I did. 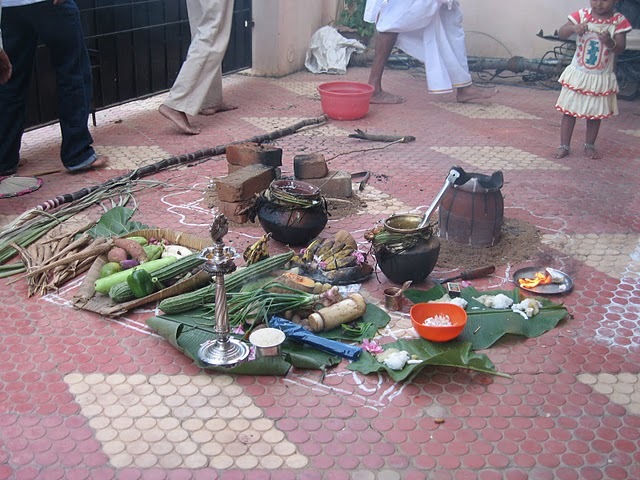 Some of the traditional customs are no longer followed or observed. So I was really so happy seeing them observed at her place. 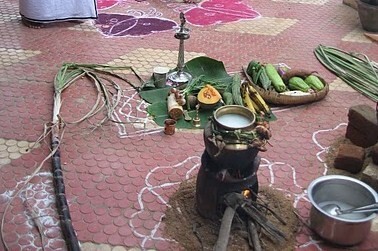 Pongal or Sankranthi is a Harvest Festival. 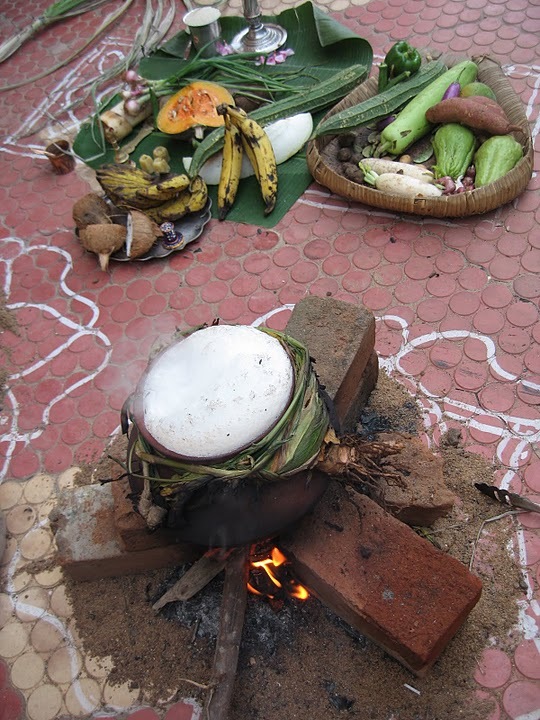 It’s the time when all the new crop that is harvested is cooked and offered as a prayer to Sun God. 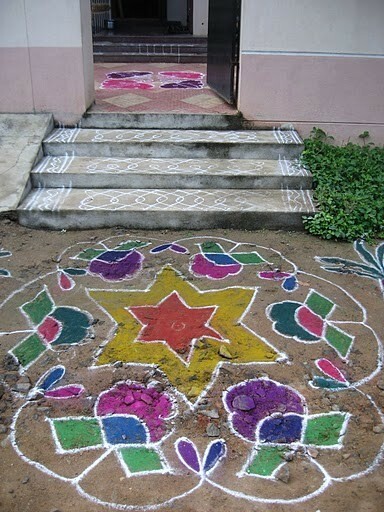 The Beautiful Kollams or Rangolis decorating the portico. 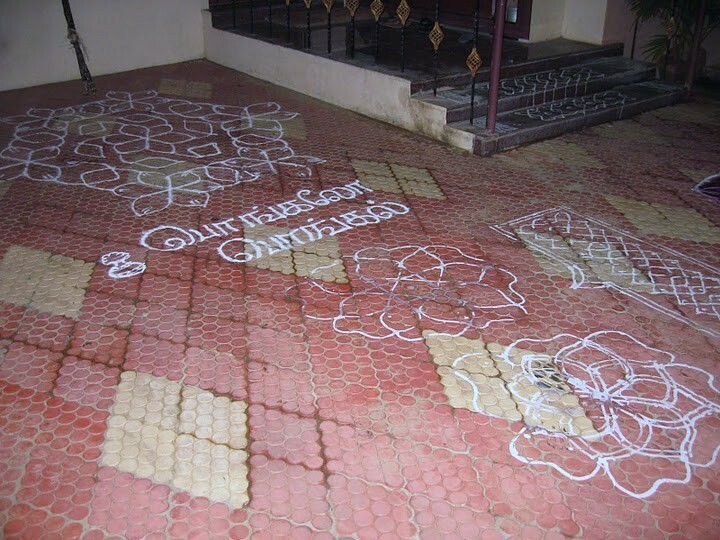 See that beautiful hand written greetings in Tamil, written by my friend. 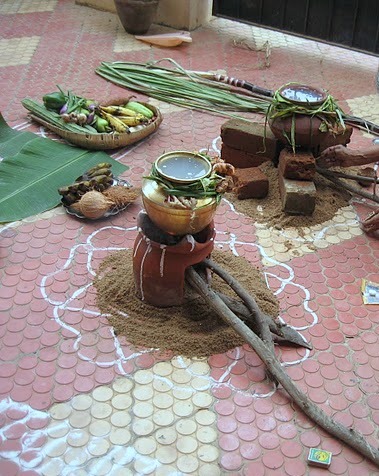 Beautiful Kollams with colours, symbolizing different colours in life, in abundance to come! 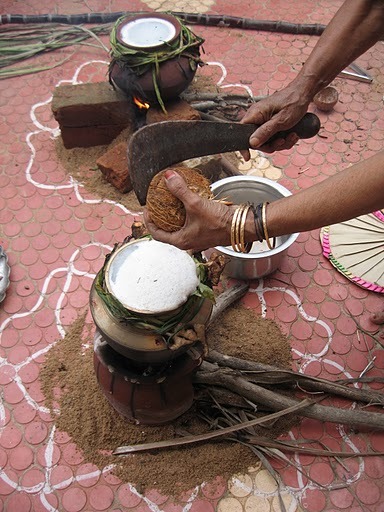 Breaking coconut directly over the rice to add more taste to the sweet pongal. Everybody takes turn to add the rice to the boiling water. The Rice gets cooked and spills over.. 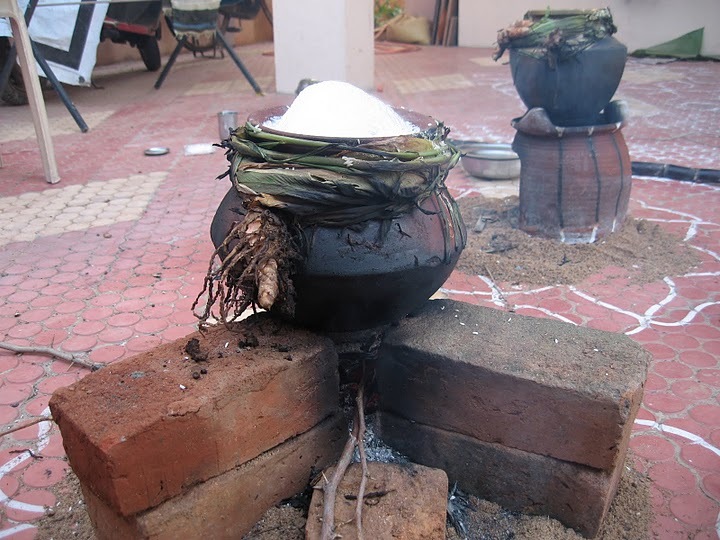 Finally once it is cooked, everybody walks around the pot singing the glory of God. Omg, am missing it terribly, thanks for sharing ur festive clicks with us Valli, feel like home.. Traditional festive celebration on a modern backdrop…Great. Thanks to your friend U for sharing these lovely pics. Thanks Valli for posting them here. wonderful lovely pictures…sure missing home…thanks for sharing..
such nice pics,thnks for sharin,. Wow! Amazing snaps. 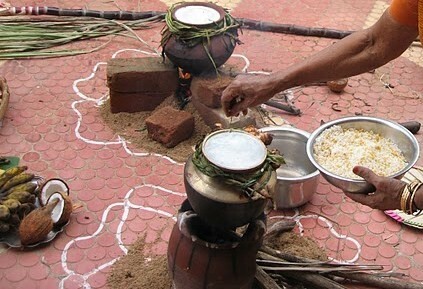 Lovely traditional Pongal..
Love those Kolams!!! Very Nostalgic!!! Nostalgia is kicking in! 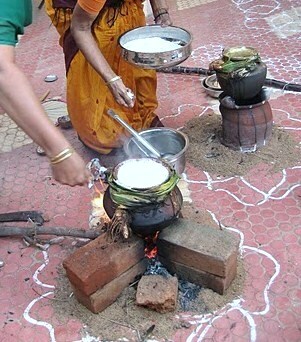 Truly said, some of the traditions are no longer observed and nice to see someone still following the tradition! 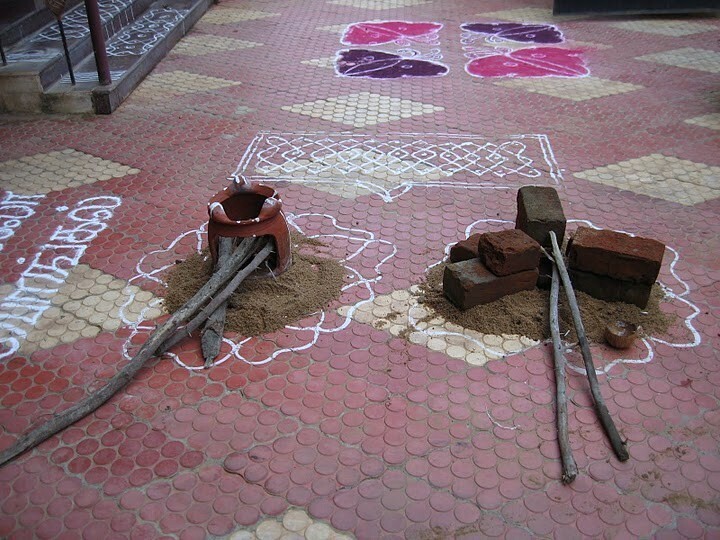 Loved each and every picture of the pongal celebration. Thank you everybody! My friend will surely be so happy reading your wonderful comments. everything is so beautiful…nicely drawn and arranged…I miss it so much!! Check my blog today for a new event….hope u will participate.. Thanks for sharing.. 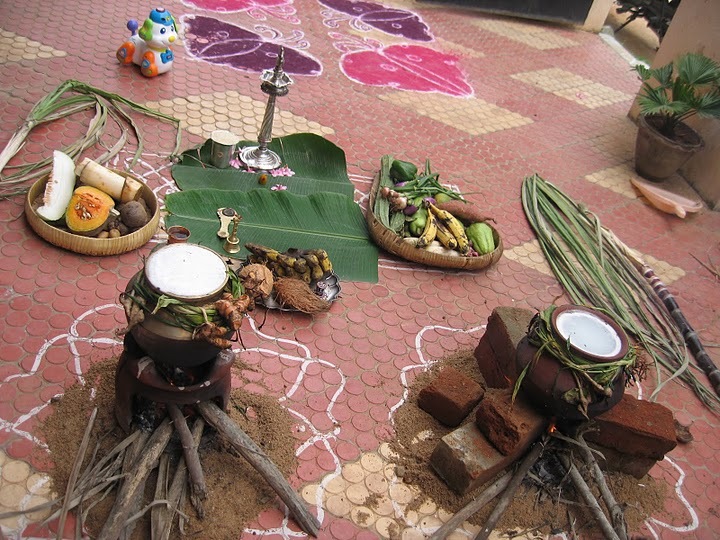 I miss the traditional pongal celebs..
Festive and lovely pictures,thanks for sharing. 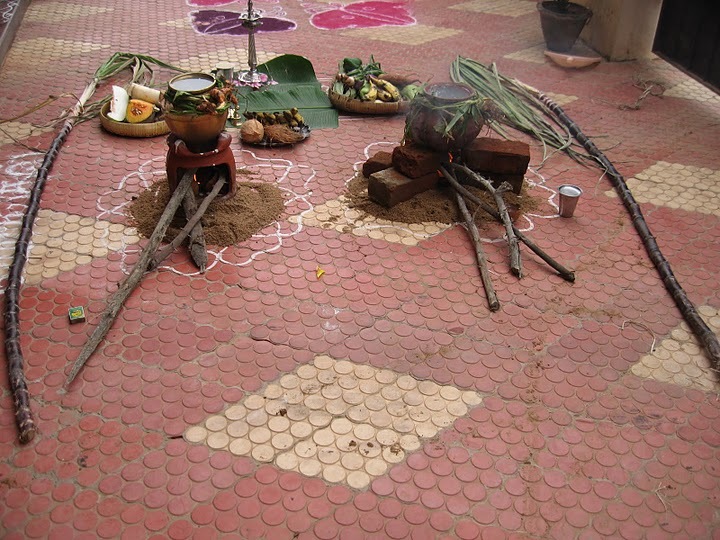 Tradtional celebrations – best way. This si something I had heard abt but not seen. Thanks for sharing it with me.